- Ok google it… you will find that this maybe an issue in the <SharePoint:Aspmenu> control in your masterpage which contains a property called MaximumDynamicDisplayLevels,,, OOOOH this maybe my life saver…. :@ but no SharePoint will not make your life that easy. - Playing around with this property and other properties like StaticDisplayLevels but in vain . 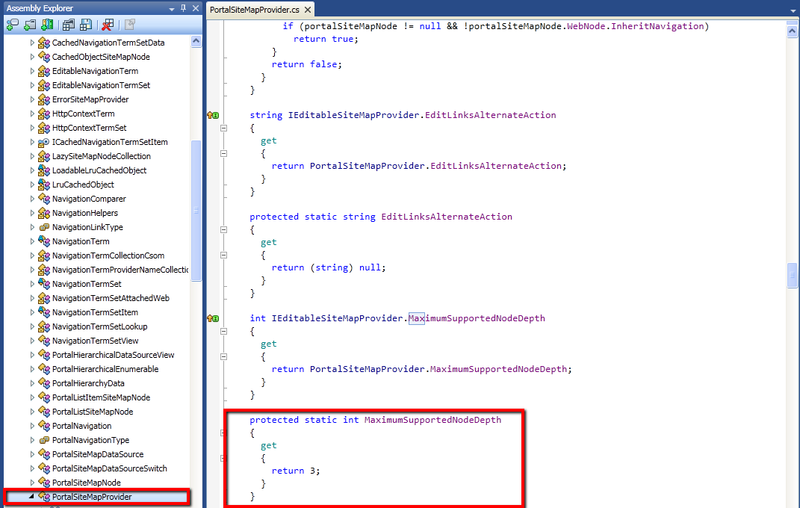 - Yes you are seeing it right, Microsoft engineers for some UNKNOWN reason had decided to HARDCODE the MaximumSupportedNodeDepth as a PROTECTED property to be UNACCESSABLE .